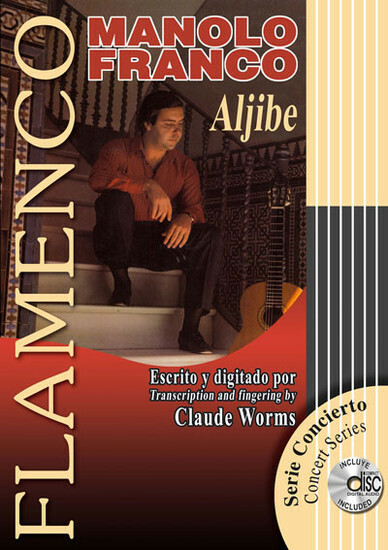 'Aljibe' heralded all that Manolo Franco would bring to his musical artistic life: an extraordinary sound - round and truly flamenco - and an emphatic, clear, clean and polished technique. Whether solea, bulerias, alegrias or any other style, he was already a phenomenon of musicality and creativity. This album was all it took to rank him among the most important composers of flamenco guitar music. These pieces - true documents for any flamenco guitar player - are unknown to later generations because that recording was not issued again and the originals, dormant, were waiting to be awakened to take their place again among the splendors of flamenco. This was an absence of a transcendental chapter of flamenco guitar since the compositions in this album, true masterpieces, until now were available only in an old recording made by the Spanish national television network. The appearance of these transcriptions is worth a lively round of applause because it is a rescue of something that belongs to all of us. The virtuosity and sensitivity of the interpretation are a gift, note by note - yours to enjoy and admire.